TICKETS: $5.00 to $12.50 and are available online at centenarystageco.org or by phone at (908) 979–0900. Centenary Stage Company is also offering FOMO Friday for students. FOMO Friday offers $5.00 tickets to any student from any school. 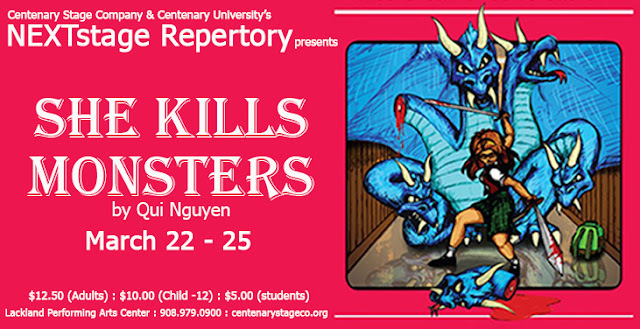 FOMO Friday tickets must be purchased in person at the Centenary Stage Company box office located in the Lackland Performing Arts Center at 715 Grand Ave. Hackettstown, NJ. .
Qui Nguyen’s comedic romp hacks and slashes to the stage as Centenary Stage Company and Centenary University’s NEXTstage Repertory presents She Kills Monsters. NEXTstage Repertory is the all-student performance division of Centenary University’s Theatre Department and highlights the close collaboration between the professionally producing Centenary Stage Company and Centenary University. Winner of the 2013 AATE Distinguished Play Award, She Kills Monsters is a comedic action-packed jump into the world of fantasy role playing. She Kills Monsters introduces us to Agnes Evans a high school English teacher as she leaves her childhood home in Ohio following the death of her teenage sister, Tilly. When Agnes finds Tilly’s Dungeon and Dragons notebook, she stumbles into a journey of discovery and action-packed adventure in the imaginary world that was Tilly’s refuge. In this high-octane dramatic comedy laden with homicidal fairies, nasty ogres, and 90s pop culture, acclaimed playwright Qui Nguyen offers a heart-pounding homage to the geek and warrior within us all.